Waterloo Articulating Keyboard Arm Ball Bearing Slide, PartNo 6170D Knape & Vogt 6170D. Load: 100 lbs, Slide travel: 16", Tray adjusts: 6", Tray rotates: 360 Degrees. Tray tilts: 25 Degrees (15 forward 10 back), Install length: 16. Ball bearing slide, Out: hold (with latch), Lever adjustment. Make your own Tray, or search: Waterloo Basic Keyboard Tray. Or: Waterloo Basic Keyboard With Mouse Tray Black. Articulating Keyboard Arm with lever adjustment Item Length: 23.4 ItemWidth: 5.85 ItemHeight: 7.8 ItemWeight: 11.08125 PackageLength: 24 PackageWidth: 6 PackageHeight: 8 PackageWeight: 11.25. The item "Waterloo Articulating Keyboard Arm Ball Bearing Slide, PartNo 6170D" is in sale since Saturday, June 04, 2016. 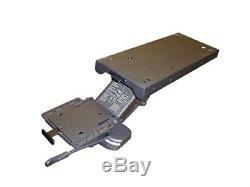 This item is in the category "Computers/Tablets & Networking\Keyboards, Mice & Pointers\Keyboards & Keypads". The seller is "promax_supply" and is located in 12 Locations Nationwide.